Moral considerations have been largely absent from our country’s public debate over what to do in Afghanistan. The Obama administration has been working since Afghanistan’s August elections to refine its goals, assess the intentions of key countries such as Pakistan, and gain additional commitments from allies in NATO. There are two broad considerations in just war theory. First, whether it is just to go to war at all. And second, how force may and may not be used. There must be a just cause and a legitimate authority. War must be a last resort, and there should be a probability of success. Military forces must limit the use of force and protect non-combatants, and there has to be a good outcome, including an exit strategy. The war in Afghanistan is especially taxing for this theory. The Afghanistan war is now well into its ninth year—longer than America’s involvement in last century’s two world wars combined. The original justification has been overtaken by events, and some operations—such as airstrikes killing a disproportionate number of civilians—have made it difficult to classify Afghanistan as a just war. Some would even argue that it is a reach to think that the war in Afghanistan could become just. These critics are not wholly wrong. It is well to remember the insight of one of the 20th century’s premier thinkers on just war: Reinhold Niebuhr. One of the biggest problems of American foreign policy, Niebuhr contended, is that Americans are tempted to overreach, to overestimate the innocence of our own power, and thus also overestimate its possible effectiveness. But for that reason alone, it is all the more important for the administration to ask larger moral questions and use theory to examine policy considerations. There are no guarantees that a risky enterprise such as the Afghanistan war will become just. But we do not have to be ethically tone deaf, either. Within this just war framework, the Obama administration can take steps to move forward by critically engaging moral considerations in regard to substantial policy changes. And just war theory may just have to evolve again to meet the challenge the Afghanistan war presents. The Obama administration’s review should move beyond resources and tactics to a broader reflection on the justness of the cause, which can help bring greater clarity to the goals of the mission. With Americans sending their family members into harm’s way, it is particularly important for the administration to bring morality regarding the conduct of the war into the dialogue. Just war considerations are directly relevant to prospects for security, peace, and justice in Afghanistan—and reflecting on the key criteria can point to specific actions the Obama administration could take. Force is reasonable according to just war theory if it is in defense against aggression, or in the protection of the vulnerable or allies. The original justification for going to war in Afghanistan—defending against the aggression of the September 11th attacks—had broad global support. That support has waned at home and abroad as the nature of the threat has changed from a nonstate actor with a base in Afghanistan to a global network that has dispersed into Pakistan and around the world. There is a moral argument for continued efforts in Afghanistan in order to enhance regional stability—South Asia has two nuclear powers—India and Pakistan—and increased tensions and instability in this part of the world could have major implications for global security. 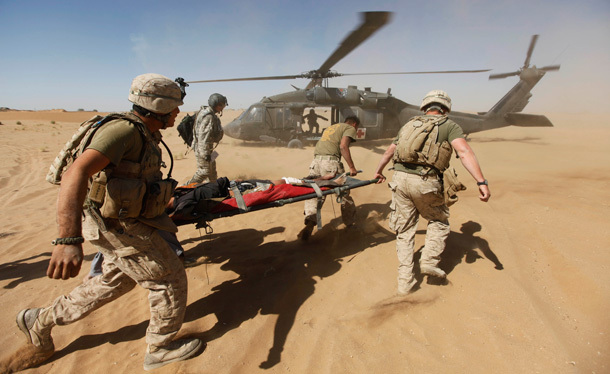 Obama should return to Congress for a renewed authorization for the Afghanistan war. The initial authorization of the war is largely outdated, but the administration can, and should, make a strong case for additional resources and renewed focus based on the global security interests and need for stability in the broader region. The symbolism of a renewed commitment would help move beyond the notion of endless war that has been perpetuated by relying on supplemental funding mechanisms each year that have not offered an opportunity for renewed and broader public debate on the issue. President Obama should also consider returning to the United Nations Security Council to renew and update the resolutions guiding the U.S. and NATO presence in Afghanistan. The current language is broad, and lacks a clear focus. And it is essential as the administration makes changes to its policy on Afghanistan that there is deliberation with the bodies that can help address the moral question of intention in regard to this war. These two steps are not necessary from a legal standpoint, but the public debate could help further define how the war in Afghanistan is a just cause—seeking to advance regional stability, prevent the escalation of regional tensions, and perhaps even reaffirming basic rights enshrined in the U.N. Declaration of Human Rights. Only a legitimate government, or internationally recognized authority such as the United Nations, can conduct war. Revisiting the authorization in Congress and at the United Nations can help address a second consideration of just war theory—the right authority. But another set of actions—focused on Afghan governing authorities—is also necessary to effectively address the question. The international community is working to obtain a more concrete set of commitments from Afghanistan’s leadership to deal with the problems that have undermined the Afghan government’s legitimacy: namely corruption, weak governance, and poor performance on providing justice. Working to boost the full range of Afghan institutions—the national, provincial, and local levels of government—is central to the effort to help achieve sustainable security in Afghanistan and address the insurgency that has been raging in many parts of the country. What some pundits have categorized as “dithering” has actually been essential to regaining leverage to shape the strategic calculations and actions of Afghanistan’s leaders, who have a feeble record of providing their citizens with basic needs. A country must exhaust all other reasonable means before using military action. The Obama administration has had extensive consultations with allies in Europe, key powers such as Russia and China, and important regional actors such as Pakistan and India. This has been one part of making sure that no diplomatic stone is left unturned. Secretary of State Hillary Clinton and U.S. Special Representative for Afghanistan and Pakistan Richard Holbrooke have logged in thousands of miles in trips as part of consultations with other countries—all part of a broader effort to develop a coordinated strategy with stronger support for all operations in Afghanistan, including military operations necessary to stabilize key parts of the country. Making sure that military operations in certain parts of Afghanistan are a last resort also requires the United States and other members of the coalition to test whether there are alternative means—including political, diplomatic, and economic ways—to deal with elements of the insurgency in Afghanistan. Using the other elements of America’s power could help reshape the calculations of some Taliban leaders and motivate them to drop their weapons. Working with countries such as Pakistan, Saudi Arabia, and the United Arab Emirates—all of whom have extensive contacts with Taliban leadership—could be a way of developing peaceful alternatives to addressing instability in Afghanistan. It is unjust to wage war if defeat is the most likely outcome. The nature of the war in Afghanistan means that U.S. military forces cannot achieve success on their own – the struggle for stability is not purely a conventional military struggle. It requires collective action by countries in South Asia and support from other countries. It also requires a stronger effort to help Afghan institutions address the population’s basic needs—security, economic development, and justice. The renewed effort to send additional resources and expertise through a “civilian surge” of diplomats and development specialists is aimed at increasing the probability of success in what is an asymmetrical war against non-state actors. Force must be limited by goals; non-combatants should be protected from harm and never targeted. Security and safety for Afghan women must be a central and not a peripheral consideration in a changed policy. The previous administration made the “liberation” of women from the harsh rule of the Taliban a hallmark of its “success.” But the human rights situation for many women in Afghanistan never lived up to this hype, and their physical, social, and civic security has worsened over time. Making the population’s safety and security central to the mission—something that General Stanley McChrystal has argued—will require a different mode of operating, and it will raise tough questions about certain tactics employed by the United States and its NATO allies such as unmanned aerial drone strikes. The proportionality question is deeply complicated by the nature of the threats posed by non-state actors and insurgencies and raises thorny questions for just war theory. But evaluating more closely the military tactics employed in efforts to stabilize Afghanistan and the broader region can help bring greater moral clarity to the mission. The war in Afghanistan raises crucial questions for just war theory, not the least of which is whether just war criteria can be used to change course in a war that is already more than eight years long. Can the cause of an on-going conflict become more just, for example, and exactly how could that happen? Can diplomacy come to play an increasing role in an on-going conflict, and if so, does that redefine last resort? The rise of nation-states posed a challenge to the evolution of just war theory, as did the dawn of the nuclear age. And now we must consider whole regions and non-state actors, rather than just individual states. This adds difficulties, but it also adds options. Questions of just cause become more acute, for example, when major regional players possess nuclear weapons. But a greater regional focus also allows other states, and entities within a state, to become diplomatic agents, perhaps reducing the need to use force at all. The regional approach also redefines the probability of success. A positive vision for a given region helps prevent actions that suppress conflict in one country only to destabilize another. Recognizing and dealing with the reality of all parties in a conflict, state and non-state actor alike, helps create more permanent solutions. It also allows crucial attention to be paid to the lives of those most affected by conflict, and those who will be affected if an unjust and unstable peace is the outcome. Recognizing global security interests in the world today requires partners, and it demands that we expand the understanding of “right authority” to include an assessment of the “rightness” of our partner states. Do they have legitimate authority and how do they exercise that authority? As President Obama makes his decisions on the next steps in the Afghanistan war, he should take care to weigh these broader moral questions in his deliberations in order to increase the chances for progress towards peace and justice in that troubled region.